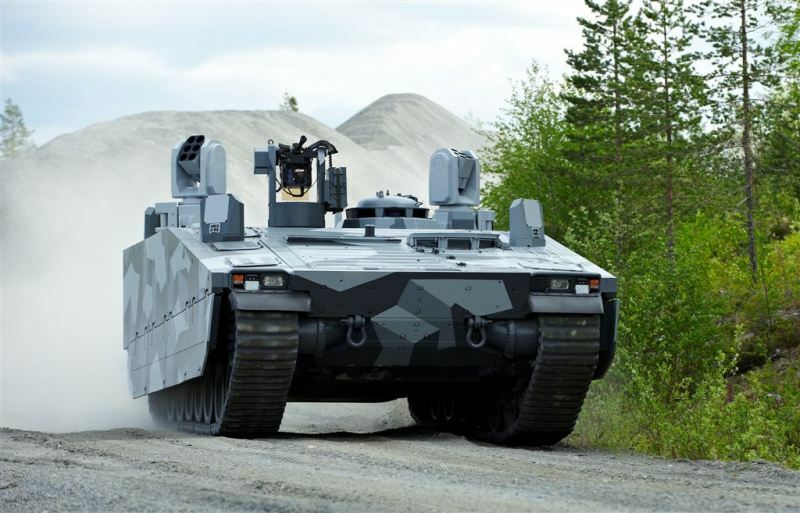 The BAE systems Armadillo CV90 tracked personnel carrier is thought to be the world’s fastest rubber tracked vehicle. Although weighing in at a massive 26 tonnes this rubber tracked monster has a 16.0 litre 810 HP Scania V8 diesel engine giving it a top speed of aprox 80KMH with a range of in excess of 850KM. Other awe inspiring statistics include the ability to climb a vertical wall 1.1 mt high, ford a river 1.5 mt deep or cross a 2.6 mt wide trench, climb a 60 degree slope whilst simultaneously offering top of class levels of protection against both anti-armour weapons and IED’s. The secret to this exceptional performance is a Formula 1 style active suspension system which uses adaptive dampers to continuously stiffen or slacken the suspension allowing a flatter, smoother and more level ride. This allows the Armadillo to soak up lumps and bumps in the landscape without sacrificing speed and performance. The rubber tracks have been proven in various NATO trials to reduce noise, road damage and most importantly vibration levels for the occupants. The Armadillo’s high tech features don’t stop there either – it is fitted with a laser guided 20mm cannon that semi-autonomously seeks and destroys targets and an amazing heat adaptive side armour that is designed to confuse enemy radar to allow it to blend into its surroundings. The Swedish made Armadillo is one of the top contenders for the Australian Army’s Land 400 phase 3 contract for a new Infantry Fighting Vehicle (IFV) to replace the venerable Vietnam era M113 APC – although the Australian Army is likely to insist on conventional style steel tracks if they proceed. Either way – I believe that as an Australian Tax-Payer, a test drive around the Army’s testing ground should be arranged so I can add my vote to where my tax dollars are going to be spent!! Yee-hah! !